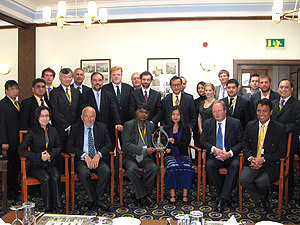 The Council of Asian Liberals and Democrats (CALD) awarded the honorary individual membership plaque to Daw Aung San Suu Kyi, Nobel Peace Laureate, Burma’s leader of the opposition, and one of Asia's most revered icons of democracy on 20 September 2010 at the sidelines of the UK Liberal Democrats Annual Conference held in Liverpool, UK. Daw Suu is the first person to be awarded such title by CALD. The plaque was received on Daw Suu’s behalf by Ms. Zoya Phan, International Coordinator of the Burma Campaign, UK. It was presented to her by CALD Chair Dr. Rajiva Wijesinha and Secretary General Dr. Neric Acosta, along with the other members of the CALD Delegation to the conference. Liberal International with its President Hon. Hans van Baalen, MP also witnessed the event. 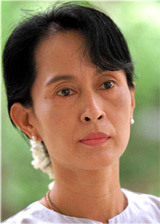 In bestowing the honorary individual membership title to Daw Aung San Suu Kyi, CALD once again affirms its unwavering support and solidarity to the people of Burma in their continuing struggle for justice, freedom and democracy.